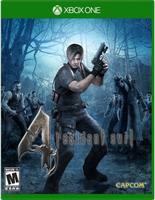 Return the zombie filled nightmare to conduct a desperate rescue mission in Resident Evil 4. Play as Leon S. Kennedy, a police officer who narrowly escaped the zombie onslaught years before and must now venture to Europe to rescue the president's daughter. Suspicious locals and tough new monsters await at every turn and players must overcome challenging puzzles and situations in order to stay alive and succeed in their mission. Fully 3d graphics bring a sense of horrific realism to this terrifying environment.